It's an endangered species. 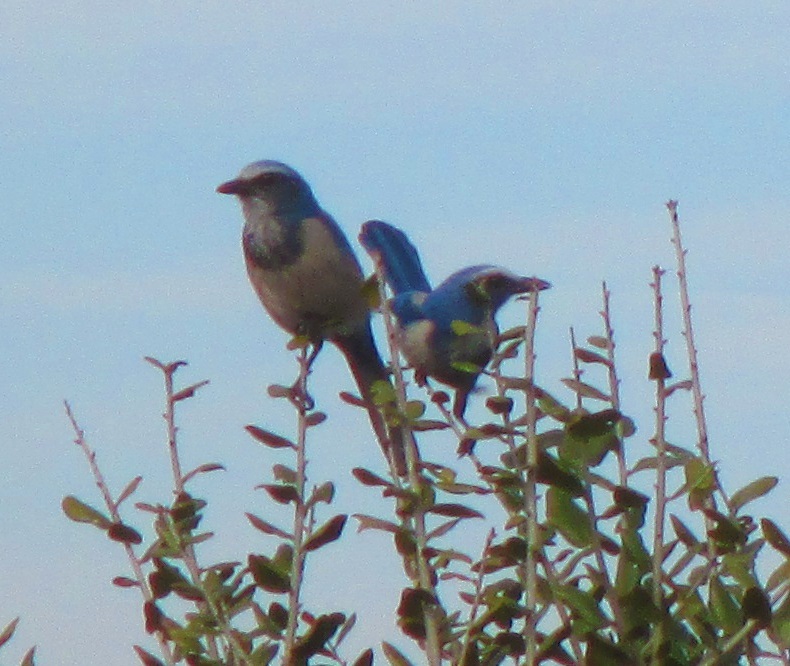 Only about 8000 Florida Scrub Jays are believed to remain, and today I had the great fortune of seeing more than a dozen of them in Juniper Prairie Wilderness area - a fire-dominated flatwood scrub forest where the 'trees' are no more than ten to fifteen feet high. Bird watching enthusiasts pay big bucks to see what I just saw. They come from all over the world, arranging their vacations specifically around the quest to add this bird to their life lists. They have no choice but to come to central Florida to see it because it exists nowhere else. I, on the other hand, just happened to stumble upon this opportunity. I knew nothing about the scrub jay before yesterday when I read this interpretive sign. And that brief lesson was all I knew as I hiked into the Juniper Prairie Wilderness area today. I was not expecting to be able to see any endangered species. Were I to lay odds, I would have given myself one chance in a thousand, at best. I didn't even know that I was going to be walking through their habitat today -- miles of scrub that was sometimes so low that I could see over it to the distant horizon. 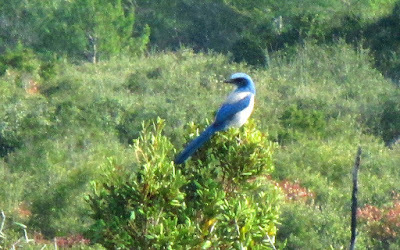 But then, as I meandered along enjoying the scenery, I began to hear noisy calls that were not unlike the ordinary blue jay, which I grew up hearing. When I followed the sound, I saw the bright blue coloration. Bingo! There were half a dozen of them flitting among the brush. When they landed, I saw that they like to perch on a prominent spot - easily visible - easy to get an unobstructed photo. Moreover, when I pulled out my camera and started shooting, creeping closer, shooting another photo every few steps, they did not spook and fly away. They let me get my shot. This happened in three different places today, and at the third I finally realized why I was so amazingly lucky. I looked down at the ground, and it was heavily trampled. There were hundreds of footprints concentrated right around where I was standing. It turns out that the Florida Scrub Jay is an easy mark. They are not shy or secretive birds, and certain people, including (I bet) paid birding guides, are regularly feeding them. I had stumbled upon a 'feeding station' in the middle of a designated wilderness area. Suddenly I felt cheated. I had not been fortunate at all. The deck had been stacked--the game rigged. The place no longer felt like wilderness - it felt like a zoo. These were not wild animals but free-roaming pets, no more special than the pigeons in Central Park. Well, perhaps I'm exaggerating. I am glad I saw them, glad to get good photos and two good videos with the sound of their calls. And I'm sure that virtually every birder who comes here is similarly rewarded. I saw some other cool things for the first time today. While crossing a sandy ATV trail I spotted bear's paw prints. I've yet to see my first Florida bear in the flesh, but this is a reminder that they're definitely out there to be seen. Later, in a swampy area I had my first sighting of shoestring ferns--a grass-like epiphyte (air plant) that seems to favor the trunks of Cabbage palms. These are not rare, but they're new to me because I've spent very little time in this climate. Note the little 'fiddle-heads' unfurling on this individual plant. Here's the more typical way they group together in tufts of dangling fronds. Finally there were a few more sinkhole ponds along my way, and today they were reflecting an interesting sky. Those clouds are alto-cumulus - made of super-cooled water droplets (liquid water at below freezing temperature) and the streaks are made by passing jets whose exhaust 'seeds' the clouds and converts the droplets into ice crystals. So much new stuff in one fifteen mile hike. I wish all my hikes could be this way.